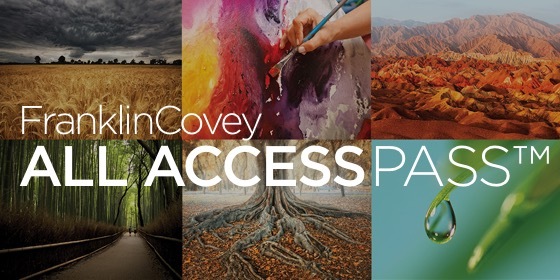 No matter your initiative or professional challenges, you can now have unlimited access to all of FranklinCovey's world-class content, assessments, tools and videos through the exclusive FranklinCovey All Access Pass. Learn about the 7 Habits and how it can help you. Ignite the unlimited potential in people. Accomplish what TRULY matters this year! Download The World’s Best Training Mobile App. Any Where Any Time. One of Mexico's largest mining companies increased production by 30% by training their managers in The 7 Habits of Highly Effective People ® . See how they were able to transform their organization. A city government is transformed by institutionalizing high-trust behavior as the core of their culture. Trust always impacts two measurable outcomes: Speed and Cost. Provo City leaders have learned that trust is an economic, financial lever — and it is a performance multiplier. "Organizational culture eats strategy for breakfast, lunch and dinner." In all of business the one thing that can't be replicated by a competitor is your culture.